Every year, in the middle of March, citizens of America start paying homage to a mathematical constant that was learned way-back-when in algebra. While they may have missed the significance of most of the lessons, one thing that stuck in their minds was pi (π). What is the importance of the relationship of a circle's diameter to its circumference? It could be the all-important wheel, but it's something even more essential... the pie. Yes, that's pi with an "e" stuck on the end. A pie with a single or double crust, lattice or plain, fruit or cream, sweet or savory, a' la mode or or not, heated or cold, eaten with a fork, a spoon, one slice or two or the whole dang thing. 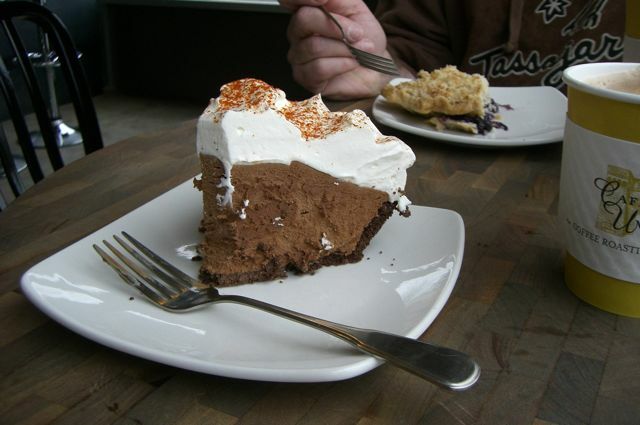 Like a good American, I celebrated Pi Day at A la Mode Pie in Seattle. Mexican Chocolate Mousse – Ole'!